Since I was very young I've always been fascinated by steam engines, although it has only been recently that I've managed to acquire a collection of my own. Many simple engines, both static and mobile, are available for sale priced in the region of £40-£100, which makes them an affordable hobby. As most models are pretty small their water-capacity, and thus steam-capacity, is pretty limited. This means that you should only expect to receive 10-15 minutes of output from an engine before having to wait for it to cool down so that it may be refilled. Still you can get a lot of fun out of an engine even with only a small amount of runtime. Even though static engines don't actually do very much - they are literally just engines mounted on a base typically with a rotating wheel as the only output, they are very interesting. Because there is nothing between you and the engine it becomes very simple to understand what is going on, and how they work. When the engine is fired up the wheel rotates: This isn't terribly exciting to most people, but good enough for me! Most people prefer the mobile engines, and below you can see pictures of two of mine. 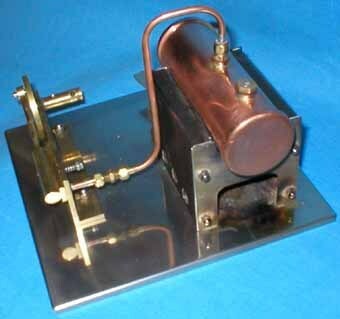 This engine is very similar to the static engine shown above, but a much more decorative and simple one. Because the engine is less "disguised" it is very obvious how simple it is, and because of that and the sheer shinyness it is an excellent (working) model. 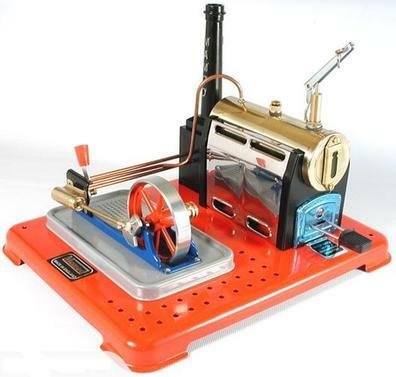 There are some more pictures of this simple steam engine available and a brief video of it in action. I was recently lucky enough to find a Mamod Roaster used on Ebay for £45 - a bargain considering they retail for around £130 new. 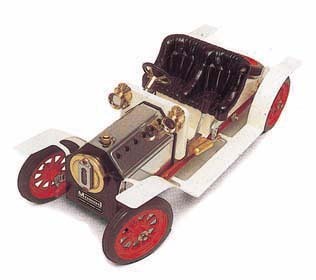 This is a very recent purchase: A very small 3-wheeled car designed by Lutz Hielscher. 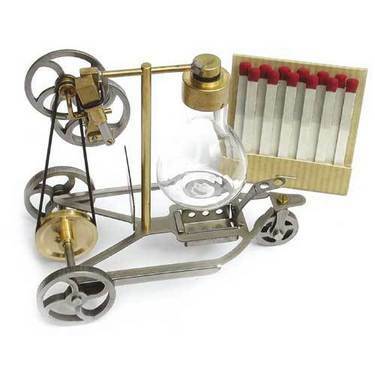 This is a modern engine, rather than a reproduction, and the fact that the water is contained within a glass bulb makes it simple to see how much water remains - it'll be hard to burn this one dry! The put-put boat isn't really a steam engine at all, but I've included it because it does use steam to move. Water is sucked into an inlet tube, heated, then fires out of the back of the boat. 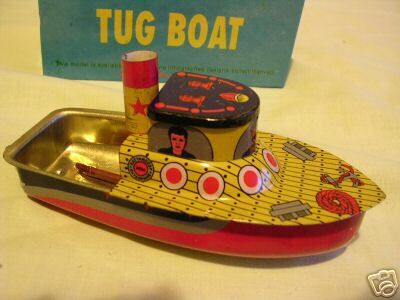 There's a couple of videos on youtube that show these kind of boats off, here is a typical put-put boat in operation. There is a lot of information online about these, including simple guides to make your own, if you're interested in such things.